Very short tiny post today to show I'm not quite dead yet and maybe ease myself back into things. Rather than write some brand new software today, let's look at some software made by other people that's really handy: KDirStat. Are you running low on hard drive space? Of course you are. I remember saving my money to buy myself a massive 200MB hard drive for my 386 back in the day, but now I can sneeze and accidentally download 200MB of stuff I'll forget about and never use. Where does it all go? Clicking on a single tile reveals the full file path in the status bar on the bottom, which is for some reason missing on my screenshot. 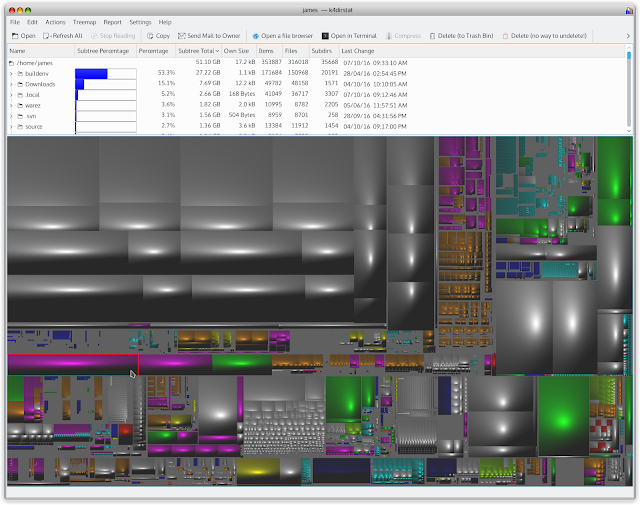 In this case, the big purple rectangles are .run files for Qt installers. You also get a list of all your top-most directories, sorted by total size, and you can expand that list to drill down into subdirs. But where this program really shines is being able to see that bird's-eye view of all your files as this neat treemap. Just about the only downside of this program is I can never remember the name of it when I need it, since I use it so infrequently. But when you really, really need it, it's an excellent tool to have. If you're not a KDE sort of person, GNOME has a similar tool I used to use called gdmap, If you're on the Microsoft, I understand there's a program called SequoiaView which I can never spell correctly. OSX folks, sorry I don't know what's good there.